The medium income earners are definitely better off today compared to the past. The monthly household income of the bottom ten percentile has been growing at a rate that outpaced inflation. The 91st – 100th (or the top ten percentile) of wage earners in the country has wage growth which is lesser than the other households income groups. 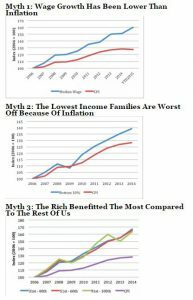 Myths 1 and 2 completely failed to account for what is commonly known as hedonic price adjustments. Hedonic adjustments are marginal variations to the inflation rate in advanced, matured economies but are significantly higher for developing nations or those who have transit from developing to developed status like Singapore. Hedonic price adjustments are the increase in prices due to qualitative and aesthetic changes in a product or service. An example is the difference in prices between a hawker centre and a food court. The increase in prices when one transit to the other is NOT included in the inflation rate. 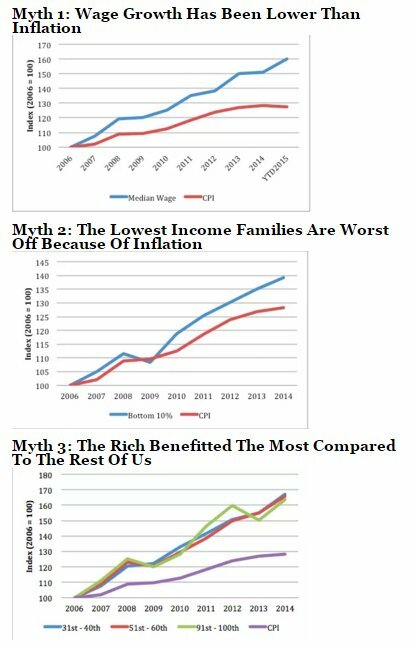 Same with Myth 3 which also failed to account for the role of investable income in relation to total income. The top percentile has a much higher proportion of investable income because of the cap in CPF contributions. In an era of elevated real estate prices, those who can invest in a 2nd or 3rd property are those in the top percentile and they earned outsize returns om their investable income. This is why the labour policies of the present government favour the top percentile because the rate of return on investment exceeds wage growth for the rest of the income distribution.